Leslie Model 212S | MOSweb Online! 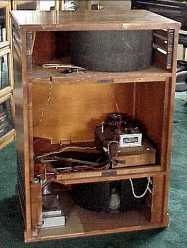 The 212S was designed exclusively for use with Wurlitzer organs. As such it has some unusual speed and channel switching schemes. One rotor is set up for fast speed, while the other can be switched from fast to slow. These controls are semi-integrated with some channel switching as well as a “Space Generator”. It is essentially the same as the 202S except for it has a solid state amplifier and a greater output rating. All together, this cabinet is NOT suitable for use as a “typical” Leslie.